Boise, ID – More than a decade after a federal court ordered the Sawtooth National Forest to create a plan to improve grazing management on the Upper and Lower East Fork public grazing allotments in the Sawtooth National Recreation Area, Advocates for the West has filed a lawsuit on behalf of Western Watersheds Project to challenge the agency’s status quo grazing decisions. These have continued to allow heavy grazing and repeated violations on these public lands. The East Fork of the Salmon River and tributary creeks on these grazing allotments are important but sensitive habitat for spring and summer Chinook, Snake River steelhead, Columbia River bull trout, and westslope cutthroat trout. After being sued previously, the Forest Service acknowledged in 2003 that grazing was causing significant harm to resources on these allotments. The Service promised that careful monitoring would in the future adequately protect habitat from grazing impacts. Management adjustments were supposed to be made to stop impairment of the watershed. However, even after additional repeated grazing violations, the agency refused to reduce grazing use or impose any penalties for non-compliance. In 2012 and 2013 the agency issued new ten-year permits, but their annual cattle grazing authorizations issued every year since have failed to meaningfully correct the problems. In addition to providing important habitat for fish species protected under the Endangered Species Act, the two allotments are within the acclaimed Sawtooth National Recreation Area and overlap into the White Clouds Wilderness. This area should provide outstanding recreational opportunities and access to unique alpine environments. 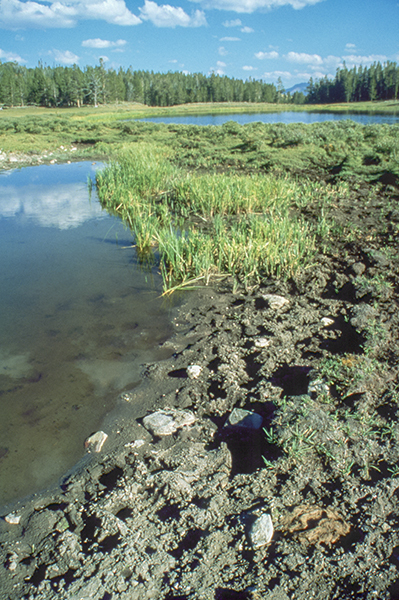 The grazing challenged here has impaired these opportunities, particularly around popular lakes such as Frog Lake and Little Redfish Lake. “Many Americans care deeply about the special lands of the Sawtooth National Recreation Area,” said Ruether. “It’s time for the Forest Service to start showing that it cares too,” said the groups. Photos of the upper East Fork of the Salmon River taken this year 2016 by Ken Cole showing the grazing abuse. Good. Although I’m not familiar with this general area, I’m tired of going to relatively pristine and wild places and seeing livestock hooves in streams and adjacent to lake beds, cow dung everywhere, listening to the bellowing beasts instead of hearing birds and elk bugling and even having them walk through campgrounds after they knock down fences. Having worked for a federal agency, I know the “good ole boy” system was a huge problem with the Forest Service and BLM in that unless groups filed lawsuits or the permittee(s), egregiosly violated the permit, many an infraction was looked the other way. While administering timber sales, I would write up violations to only be generally shrugged off by the enforcing folks. Don’t make a wave and get the project done Gary was heard more than I would have liked. Photos are really useful in documenting environmental degredations and with todays’ technology, they are quick, informative and powerful.